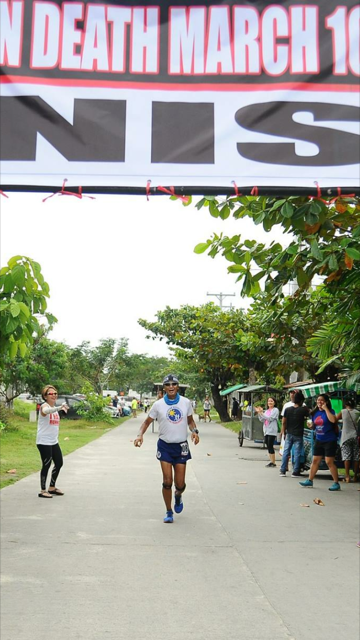 I am proud to say that I am the only Race Director and Organizer of Ultra Marathon Races in the Philippines who runs its own event. It started with my “Pilot” Event then which is now the Bataan Death March 102K Ultra Marathon Race (BDM 102). I would think then that running beyond a Marathon Distance was impossible and crazy to think among the local runners. 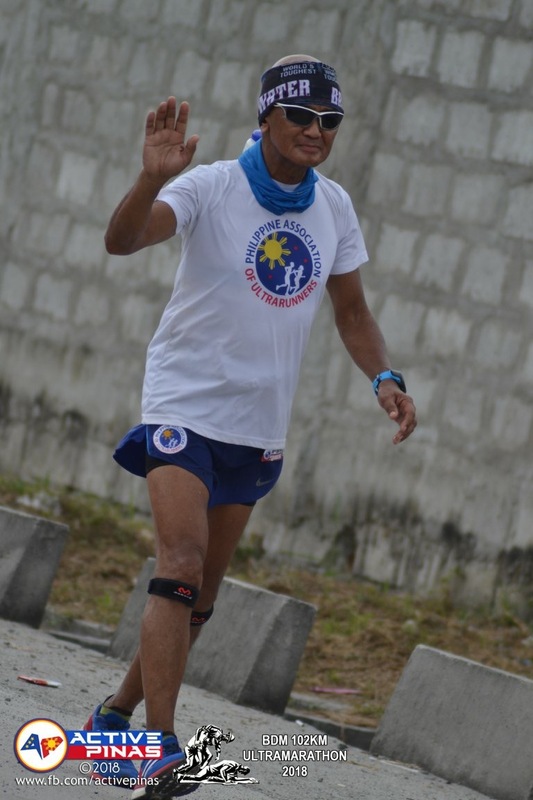 It was like breaking the borders and exploring the impossible when I thought of having a solo and single stage running event of the historic Bataan Death March route from Mariveles, Bataan to San Fernando, Pampanga. But the hard-headed in me and making my dreams possible, everything was planned out and implemented and the rest is history. But for all the local runners to see and prove that such event can be done, I have to “set the example” and run the first edition of this race with the rest of the participants. Fast Forward. While I was in Europe after I finished the Jungfrau Marathon Race last year, I received an e-mail from the John Medinger, President of the Western States 100-Mile Endurance Run stating that the 10th Edition of the BDM 102 was selected as one of the 2019 Qualifying Races for the Western States 100- Mile Run. I was shocked and amazed that a Road Race in Asia is considered as a qualifying race in the most prestigious 100-mile Trail Race in the USA and in the whole world. It is for this main reason why I decided to join this event after nine years older than when I first ran it. The second reason why I decided to join the race is to find out the present state or condition of my running body after being under the watchful eyes of a Professional Coaching Service in the USA which is the CTS (Carmichael Training System) for the past six months. And lastly, as a part of my training to “kickstart” my 2018 Ultra Racing Season in preparation for my first international event for the year, the Madeira Island Ultra Trail Race (MIUT) in Portugal on the last weekend of April. Planning for the 10th Edition of the BDM 102 had started since the months of April & May last year. And I firmly believed that my Race Staff and Volunteers would be there to administer and supervise the race while I was running the race. Slowly and surely, everything was in place and ready to be implemented on Race Day. 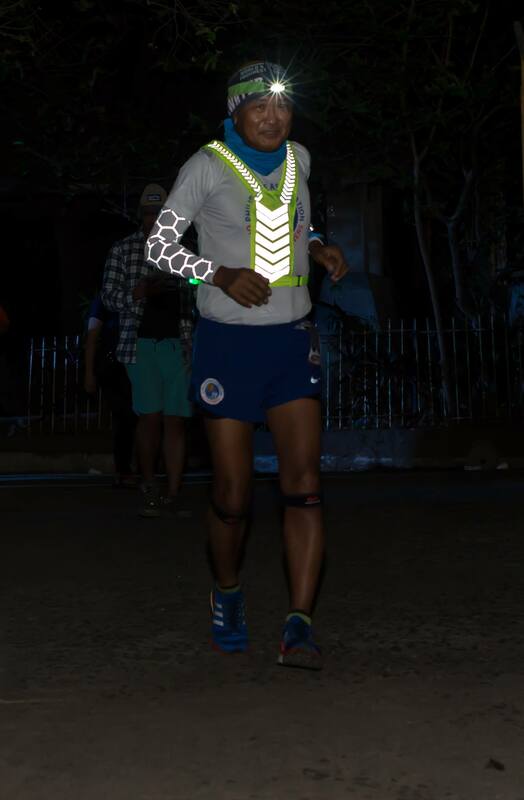 Everything that can be controlled during the race was properly attended to except for the some surprises to include the assistance of the Local Government of Mariveles, Bataan in providing us with Public Address System and Lighting System for the whole Starting Area which is the BDM Shrine where the BDM Km #0 is located. Such assistance contributed to a “Party” environment for all the Runners and their Support Crew. It also made me more relaxed and comfortable in calling the attention and delivering my last detailed briefing to everybody before the Gunstart! The best surprise of them all was the weather during the night and day as most of the runners were covered with clouds and overcast sky. It even drizzled in some parts of the route and it was the first time to have experienced a rain at the Finish Line! I knew somebody up there was also with us in celebrating the 10th edition of this historic Bataan Death March Ultra Marathon Race. I was asked by the local Police to delay the start by 30 minutes as most of the workers in the factories within the Mariveles Export Processing Zone will be leaving their respective factory/place of work at exactly 10:00 PM. The delay of 30 minutes will enable our runners and Support Vehicles free from traffic on the first 7 kilometers of the route as most of the workers traveling with their personal vehicle on this section of the Highway should have cleared the roads. The Zigzag Road from Km 2 to Km 7 is too narrow and the only long ascending portion of the route and with Big Cargo trucks, Commercial Buses and Private Vehicles on the road, extra safety was needed. The PNP made sure that only the runners would be on that section until the last runner had passed when they would open it again to regular traffic. 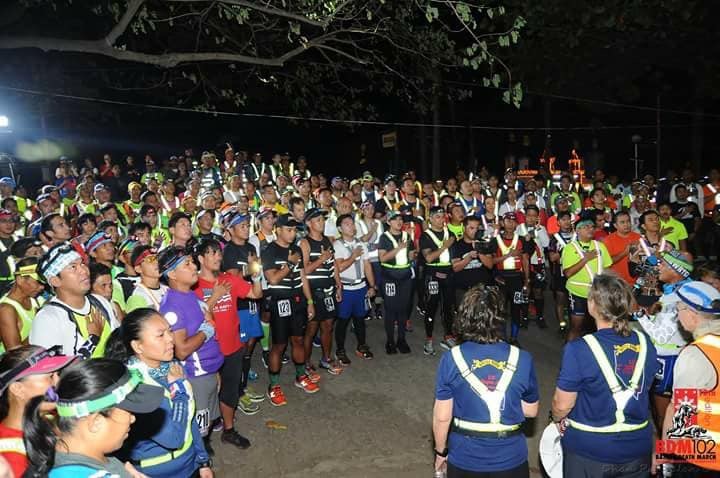 20 minutes before the Gun Start, we had our simple Opening Ceremony which consisted of a Prayer, Singing of National Anthem from the Main Actor-Countries of the Historic Bataan Death March and my usual Last Briefing and reminders on the Rules and Regulations of the Race. The short Prayer was done by Ronnel Go, one of my trusted and loyal PAU ultra runners; the Star Spangled Banner was sang by our US runners—Ann Sweat; Kim Travella; and Philip Bouve, all of whom are Veterans in their respective US Armed Services. Nobody from Japan was present and my Filipino ultra runner who teaches the Japanese dialect did not join the race, thus, we did not sing the Japanese National Anthem. Obviously, everybody sang our National Anthem proudly and loudly. I have also acknowledged the presence of 3 runners who came from Singapore—Wai Thing Law; Yang Wai Yee; and Jonathan Suerte. After some group picture at the BDM Km Post #0, the countdown started and all the runners were excited to start the journey. 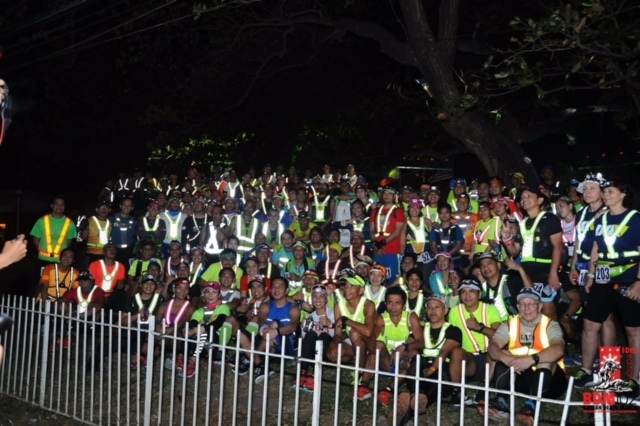 At exactly 10:30 PM of Saturday, January 27, the race started with 244 runners with 48 Female Runners. I started the two Race Timing devices on my hand and waited for the last runner to leave the Shrine before I started the run. I was the last runner to leave the Starting Line. With all those excitement, conversation with the runners, “photo-ops” or pictorials with individual runners and running groups, briefing, opening program, and giving instructions to my staff and volunteers, I forgot to prepare myself for those detailed things that I have to do minutes before the start of a race when I am a runner. I felt hungry immediately as soon as I had my first step of the race! I brought out one of my Power Bars from my Race Belt and started eating and walking on my first kilometer. No worries as I planned to hike on the ascending portion/s of the route. As the event was getting nearer, I would review my notes and my thoughts and I thought of what would be my outcome goal in this race. When my Coach sent me a message two days before the race, expressed in three 3 simple words, “Enjoy Every Step”, I smiled and conditioned myself mentally that I will Finish the race and enjoy every step along the course. And that what I was expected to do from Start to Finish—Enjoy Every Step! However, at the back of my mind, a warrior’s voice aka “Devil’s Voice” would say, “Pass as many runners as you can!” So, from the very start, it was a fight between my Coach words aka “Angel’s Voice” and the “Devil’s Voice” in me! I always advise the “newbies” in the BDM 102 that they should hike the first 7 kilometers of the route. Not heeding to this advise would compromise of what would be their running condition and ranking on the last 25-30K before the Finish Line and ultimately, on what kind of Finisher’s Medal they will receive as soon as they cross the Finish Line. After jogging the first 2 kilometers of the route which is flat, I started to power hike up to Kilometer #7. As I hiked, I was able to pass the slower runners and I would greet them and converse with them for encouragement. An arrangement was made that I would be supported during the race by two Support Vehicles and Crew of two of my PAU Lady Ultrarunners. They would alternately provide me with the necessary food and hydration aside from their respective dedicated runner. Everything went fine and perfect on this kind of arrangement during the race. From Km 8, everything was downhill and I took advantage of maintaining my “endurance run” pace with a relaxed, comfortable and steady speed and leg turn-over. I made sure that I was running with a speed of 5 miles per hour or 8 kilometers per hour. I was thinking that I should reach the first Checkpoint (Km 14) in less than 2 hours and not faster than 1:40 hours. Finally, I reached Km 14 in 1:44:44 hours and I was ranked #142. I was able to pass, at least, 100 runners as I came from behind in less than 2 hours! After 2 kilometers from the first checkpoint, it was already a “roller-coaster” on the elevation of the course along the Roman Highway, you have hills and ascending portions of the course but you will be rewarded with some descents until you reach the second checkpoint at Km 23. I was surprised to know that I was ranked #66 with a time of almost 3 hours. At this point, I was having a speed of 5 to 5.3 miles per hour and I knew I was going faster as I tend to have the desire to pass every that runner that I see in front of me! The devil was really taking over into my mind! From this checkpoint, the next 9-kilometer stretch of this route is free from any vehicles except for the Support Vehicles parked on the right side of the road and their Support Crew waiting for their runner waiting on the left side of the road. Most parts of this stretch is well-lighted with street lamps, most specially in the center of each municipality or town one has to pass. I would pass more runners on this stretch until I came out to the Roman Highway at Km 31. At the 3rd Checkpoint in Km 32, I was ranked #58 with a time of 4:12:25 hours! I was able to catch up with the Singaporean Lady Runner Wai Thing Law and her Filipino companion, Jonathan Suerte and told them that there will be no more hills to climb up to the finish line. I guess, I lied because I did not take into consideration on those ascending approaches of bridges to cross up to the Finish Line. After the Km 32 Checkpoint, it seems there are no longer runners in front of me as I was running without any “target” or reference point in terms of determining if I was going fast or slow on my pace/speed. This was the time that I thought the race was becoming boring. Not until I was in the company of Gibo Malvar, one of PAU’s candidate for the PAU Grand Slam Award for 2017 and it will be his second time to get such an award. He could be the ONLY PAU Runner who will have the distinction of coveting this Award in two successive years. Gibo and I paced with each other until I told him to get ahead after 5 kilometers. 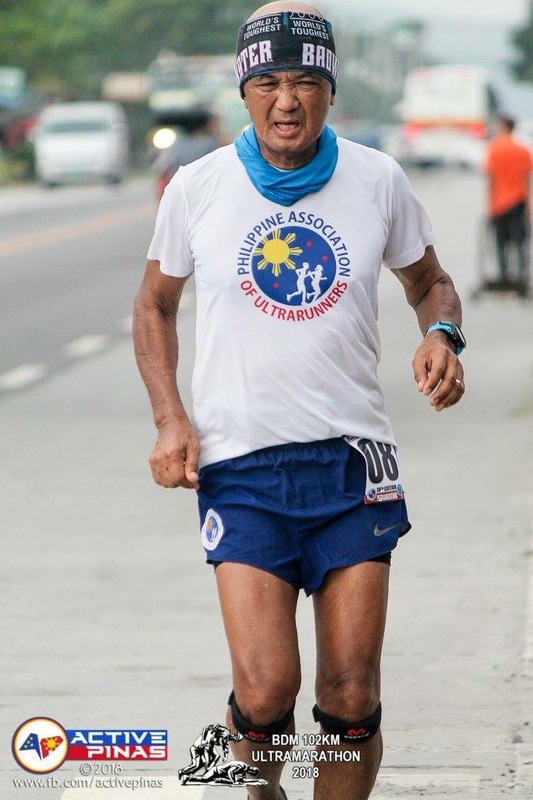 I would later catch him again at Km 45, eating some egg pie with Aldrin Pallera, another strong and consistent PAU Runner. These two runners caught and passed me before reaching Km 50 Checkpoint. I finally reached Km 50 Checkpoint with a ranking of #42 with a time of 6:28:34 hours. I could see a lot of runners resting, eating, and having their massage with their Support Crew. This is where almost all the Support Vehicles wait for their runners. I did not stop as the my Support Vehicles were still few kilometers behind me taking care of their respective runner. One of the Support Vehicles/my Support Crew was able to refill my hydration bottle and I was able to stash some food in my Race Belt before reaching Km 50. I was in the company of Wai Thing Law and Jonathan Suerte after passing Km 50 with few meters ahead or sometimes few meters behind me. It was a “see-saw” race between us until they left me for good at Km 57 when I started to incorporate power hiking with my run. 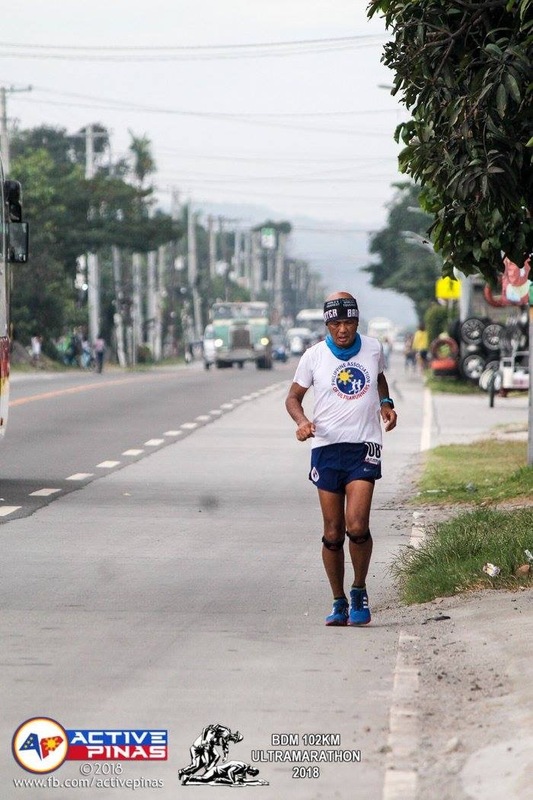 Another runner in an orange shirt passed me before entering the town of Hermosa, Bataan and even if he was fast, I could still see him from a distance and use him as my reference point of my pace/speed. It was already daybreak and it started to drizzle when I was in Hermosa. I could still see the orange shirt of the runner ahead of me when I finally reached again the Roman Highway at Km 67. A PNP Checkpoint personnel was there to make sure every runner would be able to cross the Highway safely. I started to run again once I was on the left side of the road from this point. I knew the iconic BDM Km 68 post at the Layac Junction in Dinalupihan, Bataan was just one kilometer ahead of me. I knew what to expect on the road stretch from Km 68 to Km 83. It is a 15-kilometer stretch where you meet every kind of vehicle on the fast highway of the San Fernando-Olongapo route. During the first edition, all of the runners had to cover their nose and face to prevent the dust from getting into your face/eyes and into their lungs. This stretch of road was under construction and being cemented at that time. The strategy to maintain your sanity in running on this section is to jog, run, and hike with a rest of power hiking! But with the heat of the sun, it will slow you down tremendously if you don’t be friends with ice water, wet small towel with ice cubes placed on top of your head or ice bandana tied around your neck or regular dousing of cold water on ones head, face, neck and upper body. However, in this year’s edition, the weather was so kind to everybody that I could feel a cold breeze coming from the East (in front of me) until I reached the commercial district of Lubao, Pampanga. It is just a matter of time that I would reach the Lubao Bridge (Km 82). It was on this stretch that some of the runners would be able to pass me and I would console myself with a reason that these runners are half younger than my age. I finally reached Km 83 Checkpoint with a ranking of #53 with a time of 9:58:15 hours. My speed had decreased tremendously as I started to hike longer than jogging. From 5.3 miles per hour, I would estimate that I was averaging a 4-4.5 miles per hour speed at this point. One runner was on sight in front of me and I tried to use him as my reference point but to no avail. He just disappeared after a few minutes. At Km 90, fatigue and some tightness on my legs started to slow my pace and I knew more runners would be passing me. It was good that these runners are my PAU regular runners that they were kind enough to share their support-logistics to me aside from the designated Support Vehicle and Crew for me. The plan to finish the race in 14 hours or less than 15 hours was nowhere in sight when I reached Km 100. The “angel voice” in my mind returned and reminded me to enjoy every step up to the finish line. I started to jog, run, and power hike on the last 2 kilometers and on the last turn towards the Finish Line, I saw the Finish Line Arc and some energy brought me back to jog all the way to the waiting crowd. I finished the 10th edition of the Bataan Death March 102K Ultra Marathon Race with a ranking of #60 among the 212 finishers with a time of 15:20:08 hours. At first, I was sad that I was not able to improve my time of 15:18:45 hours when I was 9 years younger but I realized that with every year that a person gets older, his body mass and VO2 max deteriorates or decreases making him slower and weaker. But with my performance in this race, I would conclude that I have not aged or never got older since the day I first ran this event. “For you to run the same time as you did at the 1st edition of BDM shows your fitness right now. More focus on quality efforts over quantity has helped improve fitness. Not placing such a high emphasis on hard workouts and just as much focus on the recovery process (rest days) has allowed you to be more fresh and rested for workouts. As you age, you lose muscle mass and your aerobic capacity is lowered. Focusing on high intensity intervals and consistency with a strength routine is required to continue to make improvements. Thank you, Coach John. I really enjoyed every step along the course as I finished the 10th edition of the Bataan Death March 102K Ultra Marathon Race! Congratulation to all the Finishers and a greetings of “Good Job” to all my BR’s/PAU Staff and Volunteers for yet another successful edition of the BDM 102. Congratulations Sir BR! you did a super good job. Your time was great, only a couple of minutes slower from 9 years ago. Well done and keep up the excellent running. All the best to you.